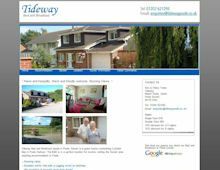 Tideway Bed and No Breakfast in Poole offers good quality B&B accommodation for tourists visiting the Dorset area. It is also ideal for business person accommodation in Poole wanting a home from home Monday - Friday. With room only rates, it is an affordable option when you're looking for "just bed" and a light breakfast (included free of charge). This Dorset Bed and Breakfast overlooks Lytchett Bay in Poole Harbour and behind the house is a lovely garden to relax in and enjoy the weather. The bed and no breakfast accommodation offers a choice of twin or double rooms with single occupancy rates available. There is also a lounge/diner with TV available for guests to use.